WASHINGTON (AP) — Despite blunt warnings about costs and consequences, President Barack Obama and European leaders have limited options for retaliating against Russia's military intervention in Ukraine, the former Soviet republic now at the center of an emerging conflict between East and West. Russian President Vladimir Putin has so far dismissed the few specific threats from the United States, which include scrapping plans for Obama to attend an international summit in Russia this summer and cutting off trade talks sought by Moscow. Because Ukraine does not have full-member status in NATO, the U.S. and Europe have no obligation to come to its defense. And broader international action through the United Nations seems all but impossible, given Russia's veto power as a member of the Security Council. "There have been strong words from the U.S. and other counties and NATO," said Keir Giles, a Russian military analyst at the Chatham House think tank in London. "But these are empty threats. There is really not a great deal that can be done to influence the situation." As if to underscore that point, Putin on Saturday requested and was granted permission to use Russia's military not just in the pro-Russian region of Crimea, but also throughout Ukraine. Putin's request came one day after Obama warned that any violation of Ukraine's "sovereignty and territorial integrity would be deeply destabilizing." Saturday's developments follow three months of political upheaval in Ukraine following President Viktor Yanukovych's rejection of a partnership agreement with the European Union in favor of historical ties with Moscow. Yanukovych fled Kiev, Ukraine's capital, last week and now is in Russia. Putin's moves are sure to deepen tensions in his already troubled relationship with Obama, who has struggled to find a formula for getting the Russian leader to change his calculus on a myriad of issues. The White House said the two leaders spoke for 90 minutes Saturday, with Obama warning Putin that Russia's "continued violation of international law will lead to greater political and economic isolation." American efforts to punish Russia on Ukraine and other matters have been complicated by the White House's need for Russian cooperation on stopping Syria's civil war, negotiating a nuclear accord with Iran, and transporting American troops and equipment out of Afghanistan through Russian supply routes. "We face a difficult choice of punishing Russia by effectively punishing ourselves," said Andrew Kuchins, the director of the Russia program at the Washington-based Center for Strategic and International Studies. Obama has tried to use his travel plans to Russia as a bargaining chip before, in the hopes that Putin might bend under the threat of a diplomatic embarrassment. Last summer, the White House dangled the prospect of canceling a bilateral summit between Obama and Putin as it pressed Russia to return National Security Agency leaker Edward Snowden to the United States. When Russia instead granted Snowden temporary asylum, Obama canceled his one-on-one meeting with Putin, but still attended an international meeting in St. Petersburg. U.S. officials say they are in discussions now with European officials about Obama and other leaders possibly skipping the Group of Eight economic summit scheduled for June in Sochi, the site of the just-concluded Winter Olympics. Obama's top advisers gathered at the White House Saturday to discuss other options. The White House appears to be giving no serious consideration to American military involvement in Ukraine. In his carefully worded statement Friday, Obama avoided saying that a destabilized Ukraine would be a national security concern for the U.S. Instead, he said only that it was "not in the interest of Ukraine, Russia or Europe." 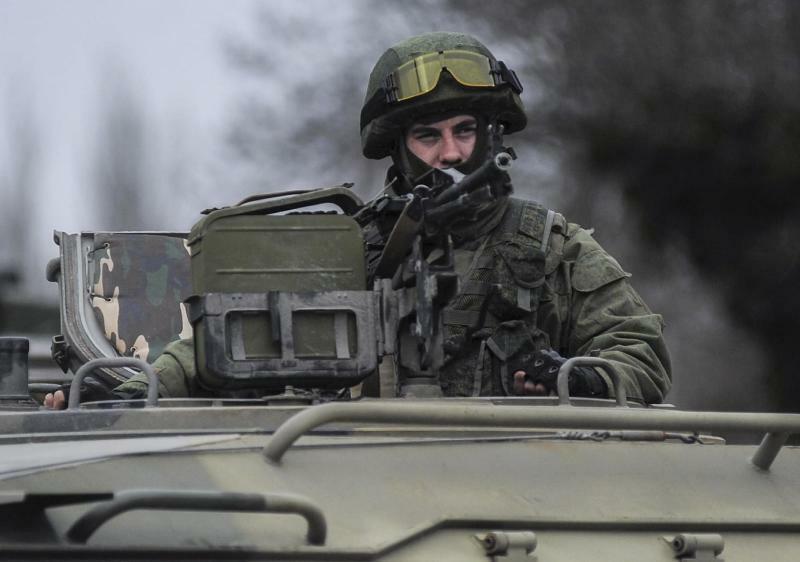 In Europe, officials expressed concern about the Russian military escalation, but offered few specific options for stopping or punishing Putin. The European Union, dealing with its own internal problems, has appeared reluctant to fully embrace troubled Ukraine or risk the economic consequences of confronting Russia, one of its largest trading partners. "The world is on the verge of a conflict the outcome of which cannot be perceived yet," said Polish Prime Minster Donald Tusk, whose country shares a border with Ukraine. Tusk appealed for Europe to send a "very clear signal" that it will not tolerate acts of aggression, but he did not outline specific steps. Czech Foreign Minister Lubomir Zaoralek said Russia's attempts to "escalate the situation in Ukraine" reminded him of the 1968 Soviet-led invasion of Czechoslovakia, which crushed liberal reforms and ended an era known as the Prague Spring. "We don't solve and can't solve disagreements in Europe by force," Zaoralek said. The U.N. Security Council met for a second straight day to discuss the growing crisis in Ukraine, which has asked four permanent council members — the U.S., Britain, France and China — for help in stopping Russia's "aggression." But Russia, as the fifth permanent member, holds veto power, meaning there would be virtually no chance of getting even a resolution condemning Russian intervention. Associated Press writers Monika Scislowska in Warsaw, Poland, Shawn Pogatchnik in Dublin, Jan Olsen in Copenhagen, Denmark, Suzan Fraser in Ankara, Turkey, Karel Janicek in Prague and Greg Katz in London contributed to this report.